In the “traveler community” that we are now a part of, there are blogs, vlogs, websites, podcasts, Pinterest boards, Facebook pages and more run by fellow travelers. Each has their particular opinions on everything from how to pack light to what the best route is to take through Laos in the springtime. As we planned for our trip around the world, these sources became invaluable to us. 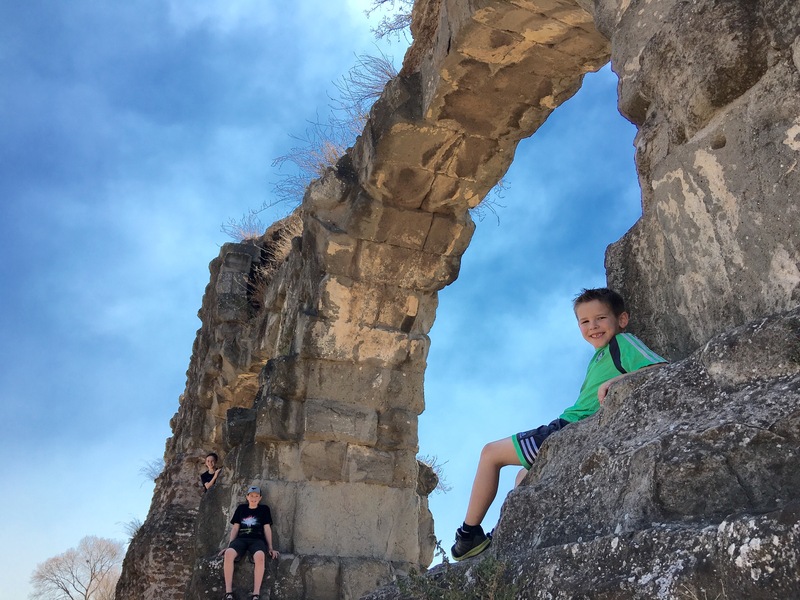 Our trip is so much easier because of the many things we learned; however, as we got wrapped up in this world of airline points and Air BNB I have forgotten that everyone doesn’t know all of these things and they typically don’t really care to either. This was made clear to me when Jeromy was talking to my brother about our packing plans and saying how he chose a pair of pants because of a packing blog he had read. My brother burst out laughing and said, “You read a blog about what to pack? !” Oh yes, we read many blogs on what to pack, what credit cards to use, what tech to bring, you name it and there is a probably a blog about it. Even if the thought of reading any of those may sound as interesting as watching paint dry to you, we spent months reading, listening, and pinning as much as we could. While doing this has made traveling the world for a year with three kids possible (and fun! ), I also realize that this was when we crossed over into “travel nerd” territory. One topic that inevitably comes up with these “travel experts” is the difference between being a traveler and being a tourist. Is there a difference you may ask? Oh yes, just like there is a right way to roll your clothes when packing, there is big difference between a traveler and a tourist. 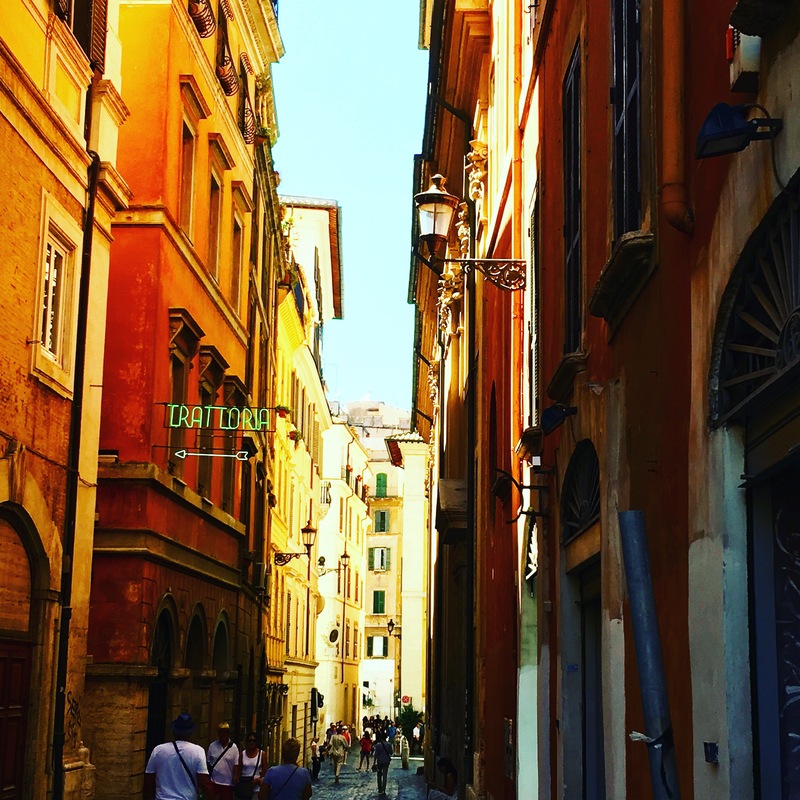 For those of you who aren’t travel nerds like us, I will use this post about our time in Rome to let you know the difference between them. In doing this, I would like to point out that on our trip, we spend time in both these categories, and we think it is a little pretentious of our fellow travelers to tell someone how they should travel at all. Here are some examples to help illustrate the point. I wish I had been a bit more of a tourist and took more pictures while we were in Rome but I took a very traveler approach and chose to just experience more in the moment, to be remembered only in my (not exceptionally great) memory. 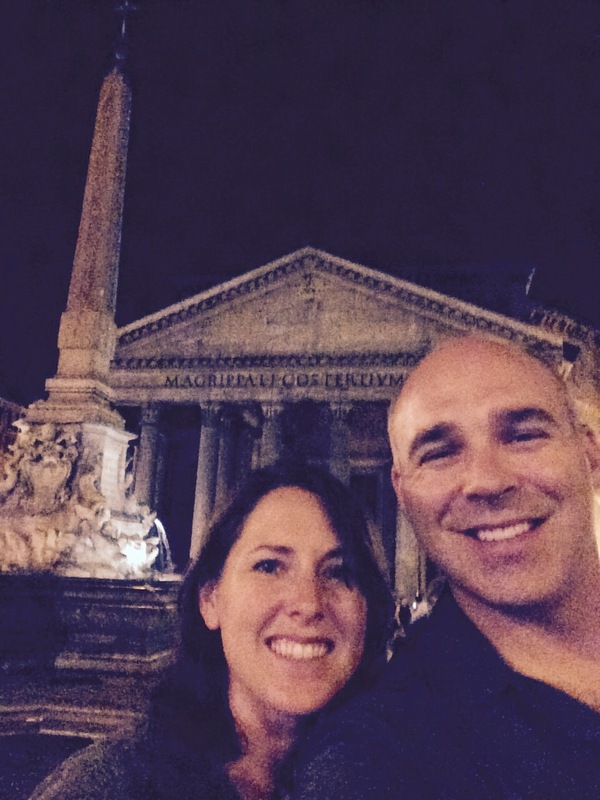 The apartment we rented was 1 minute from the Pantheon. Our first night we were tired and hungry and picked the first restaurant on the square we saw. It was a good solid meal, nothing special, but we had an amazing view! On our taxi ride in from the airport we asked our taxi driver the places he would go to eat and he let us know a neighborhood we should go to try something out of the way. I don’t have any pictures from the meal because it was the worst meal we had! Most the time this isn’t the case, but you never really know. 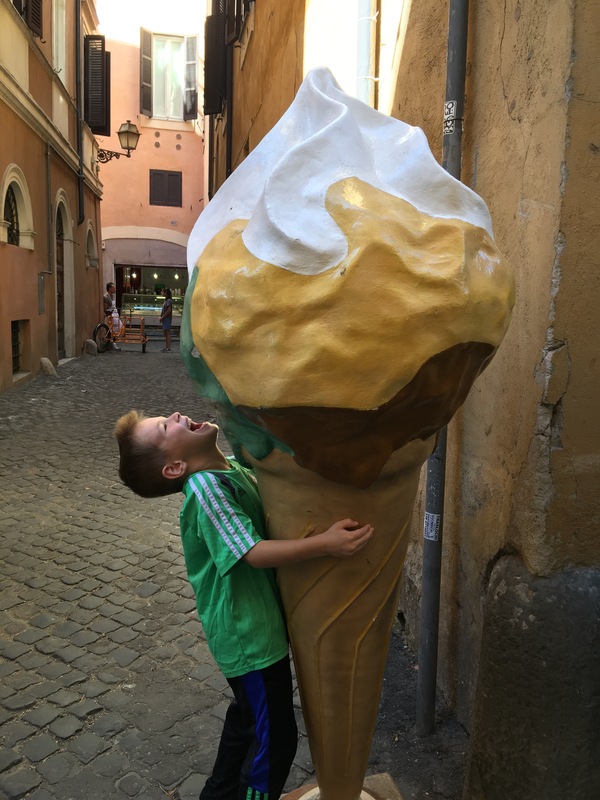 You just have to laugh it off and go get a double portion of gelato to make up for it! He did give us some great suggestions for gelato places. Sometimes restaurants are popular because they taste good not just because they are a tourist trap! In saying this, we’ve found some real treasures by asking locals at other times as well. Do both. Go to the out of the way treasure a local told you about and eat at the place every other tourist visits as well. They can both be amazing experiences. 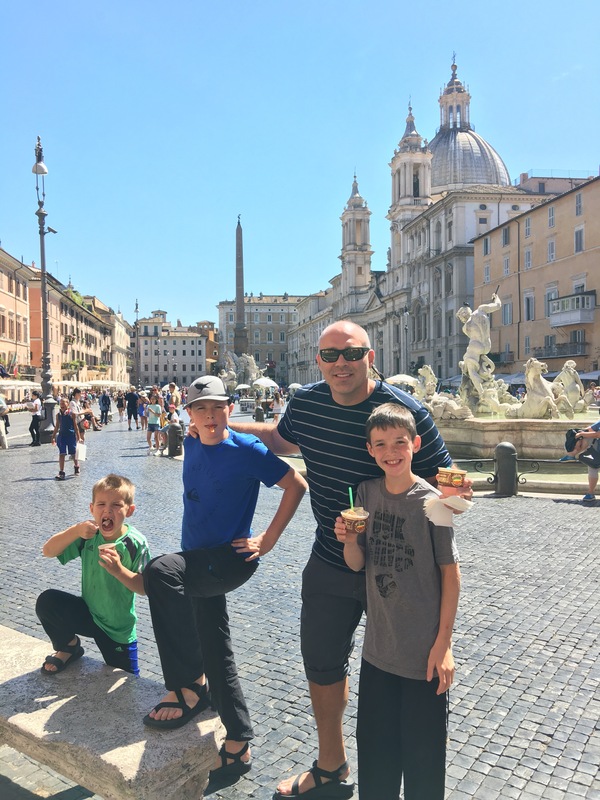 We did this the first day and realized pretty quickly that walking the streets of Rome on an August afternoon with three kids is about as pleasant as getting your fingernails ripped out. It’s hot, uncomfortable and no matter how amazing the sight, all you can think of is sitting in an air conditioned room or dumping a bucket of ice over your head. Add in three complaining kids and you can imagine how much you would enjoy the experience. Here we are first thing in the day. Everyone is getting a little hot, but still excited about all the amazing things we will see. It was getting pretty hot as we walked towards the Colloseum and Forum so we stopped off in the shade to rest. We’re fading, but still enthralled by the things we are seeing. Check out the “bench” we are sitting on. 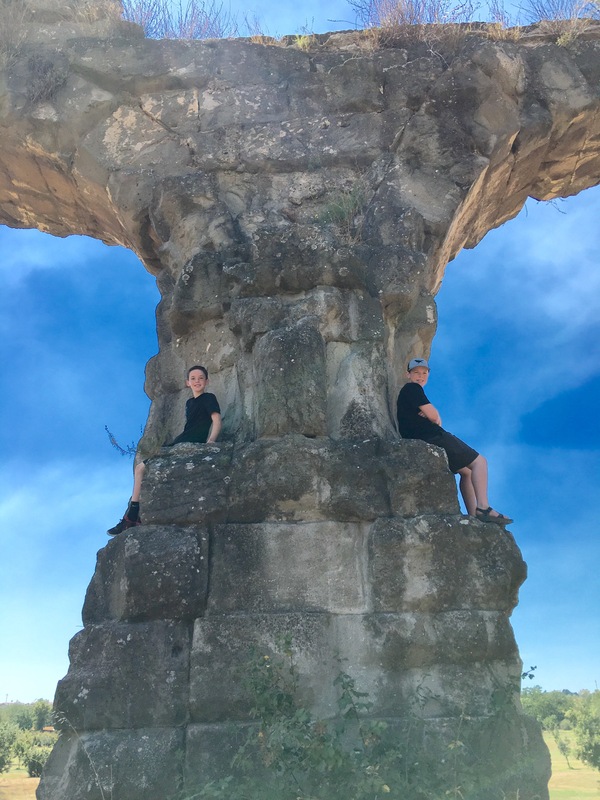 The top of an ancient Roman column! Things disintegrated quickly as we walked through The Colloseum. Parker put his Rick Steve’s audioguide on headphones and went ahead. 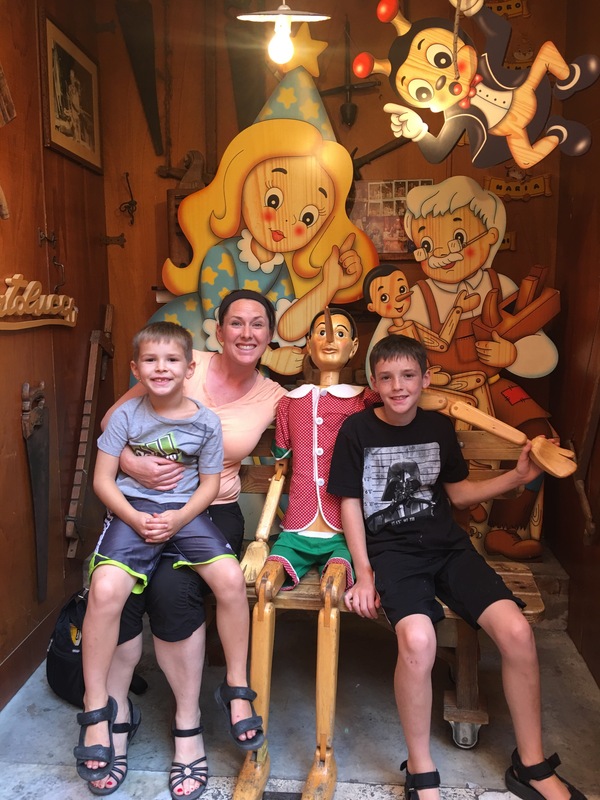 Things are going downhill, but they are still able to refrain from bugging their brothers and fake a smile for the camera just to please their sweating and frustrated mother. They are standing inside The Colosseum and beyond the arch behind them is the Roman Forum. 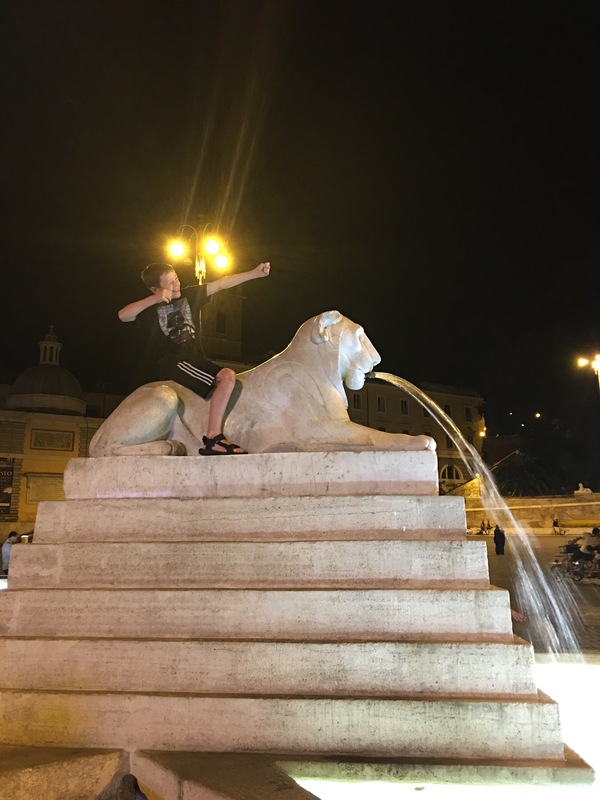 Fortunately, they did have really cool water fountains like this one near The Trevi Fountain all over the city. It allowed us to go a little longer than would have been possible otherwise. So for the rest of the time we were there, we adopted the locals schedule. We got up (not too early) and got our sightseeing done in the morning. Then we came back to our air conditioned apartment for 3-4 hours in the afternoon when the heat was the worst. We would head out after the sun went down and get dinner and explore Rome at night. This is what the Romans do. If you eat dinner at 8:00 here, it’s considered early. 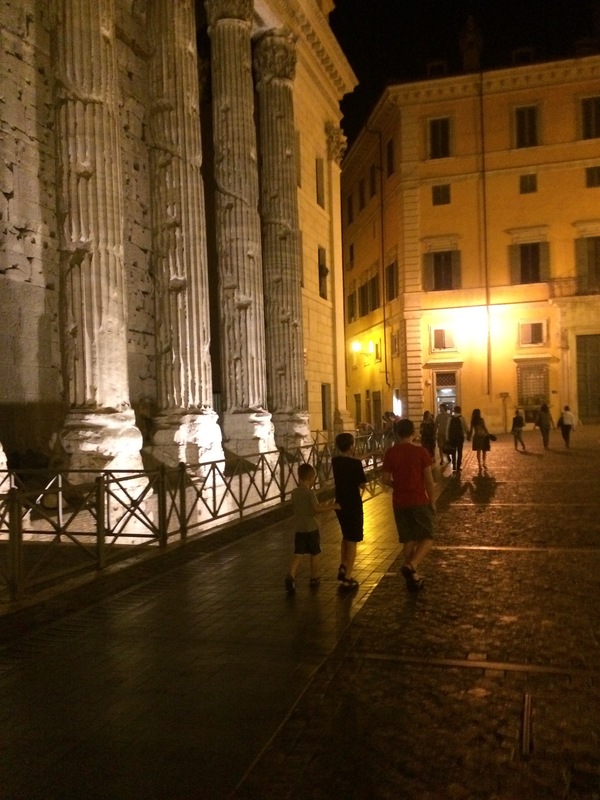 Most Romans eat about 10:00 and the streets were generally still packed when we would head in about midnight. Out at night at the Piazza Navona in front of the Fountain of the Four Rivers designed by Lorenzo Bernini. It represents the four major rivers of the four continents where the papal authority had spread up to that point: the Nile in Africa, the Danube in Europe, the Ganges in Asia, and the Rio de la Plata in the Americas. 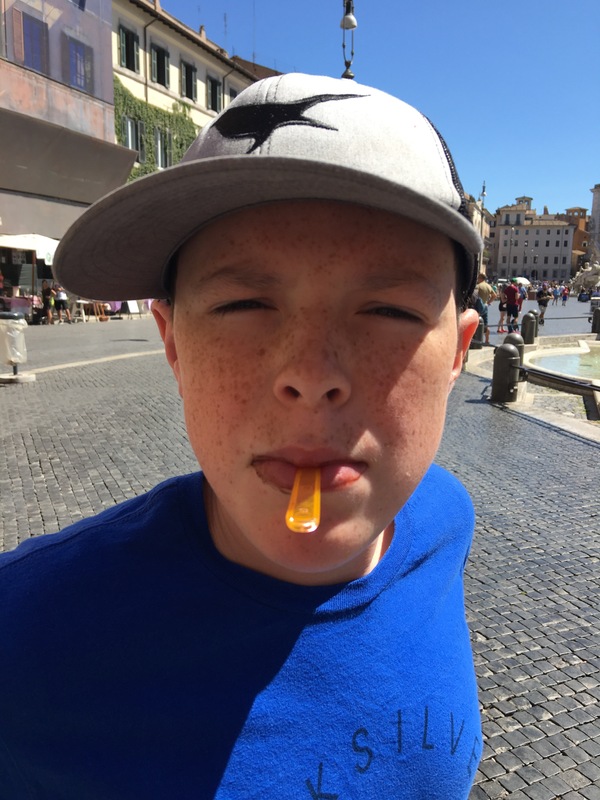 Playing with bubbles in Piazza del Popolo. We saw these bubble people in most squares we were in throughout Europe, but this lady (earning enough money to get from one place in the world to the next) let us join in the fun. Parker got pretty good! The boys loved watching these street artists create artwork with only a few tools, spray paint, and stencils, all in record time. Very impressive! Visiting the Trevi Fountain at night. It was just as crowded, but without the heat of the day pounding down on us we were able to sit for awhile and enjoy the people watching, not to mention the beautiful fountain. The boys created a battle game using the fountain as a world where their civilizations fought one another. I didn’t quite get it, but I love the creativity! I love this picture because Jeromy and Parker are twins again! Luke and Tyler were playing in the square while Jeromy and Parker read their books. We don’t have room for hard copies so our books are all digital. Thank you Overdrive and the public library for making it all free! 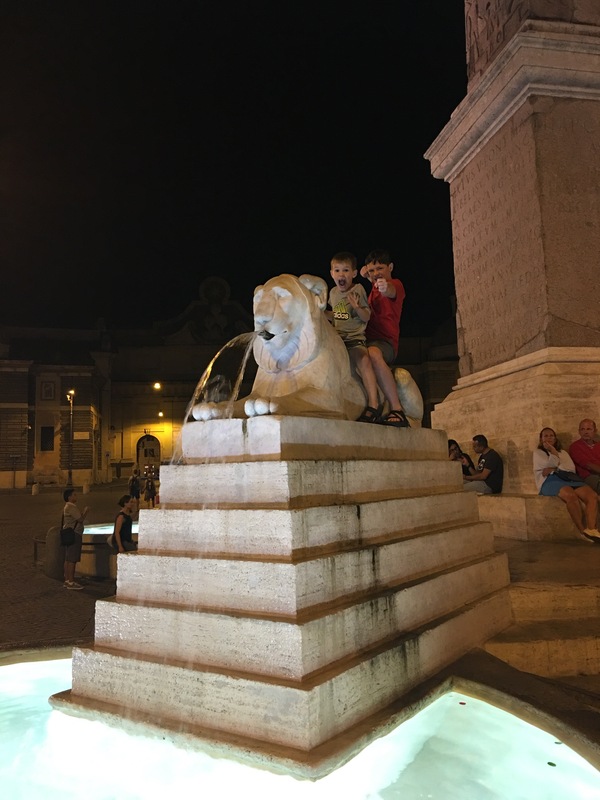 There are some pretty amazing sights in Rome and especially when you are limited on time, it is actually very helpful to have a good guidebook or website that can help you get the most out of your time. We definitely spent time checking off the major places to see. Michelangelo’s Pieta ✅, Located in St. Peters Basilica ✅, in Vatican City ✅. My favorite statue of all time. When you have a little more time and get off the beaten path, it can be a lot of fun too! We were wandering around one night and came upon this fun festival down by the river. Foosball under the bridge! So fun, even though Luke and I lost. When did my boys get to the point where they can legitimately beat me at things? Our last day in Rome we took the Metro out to the Roman Aqueducts. 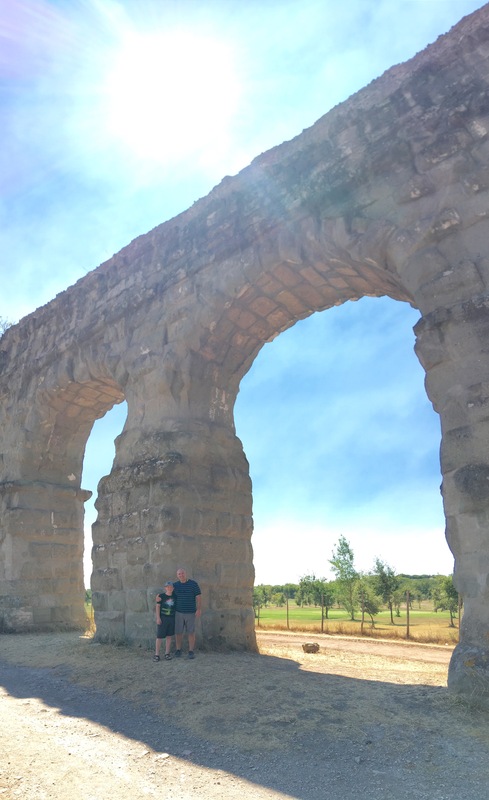 It was really cool to see this amazing feat of engineering from 2000 years ago that brought water all the way into Rome, and is still sort of standing today. 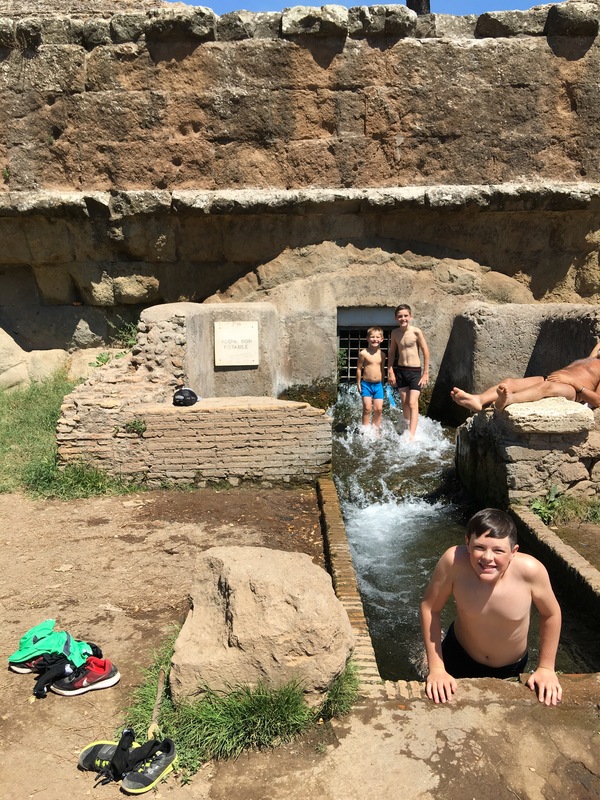 It was another really hot day and as we were walking back we happened upon some kids and men cooling off in the run off from a current aqueduct. Since my boy’s underwear cover a lot more than any of the speedos everyone else was wearing, they stripped down and hopped in to cool off. It made for a memorable afternoon joining in on the local way to cool off. How can you see some of these things and not take a picture? I think it makes it fun! I didn’t even get anything scenic in this, we could be in Washington for all you know! We threw coins in the Trevi Fountain guaranteeing we would return some day! It’s worked so far for me! The Swiss Gaurd in Vatican City. The smallest country in the world. The statue of St. Peter in St. Peter’s Basilica. You can see where his foot has been worn down by the faithful who come here to rub or kiss it in honor and prayer to this great man. 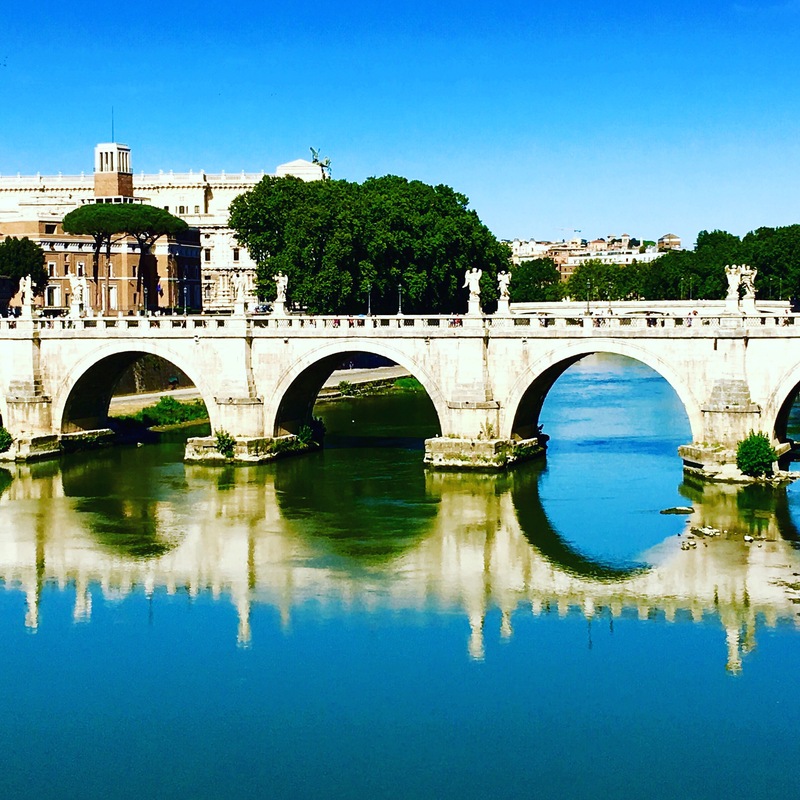 There is one thing any traveler, tourist or local will agree about when you are in Rome. 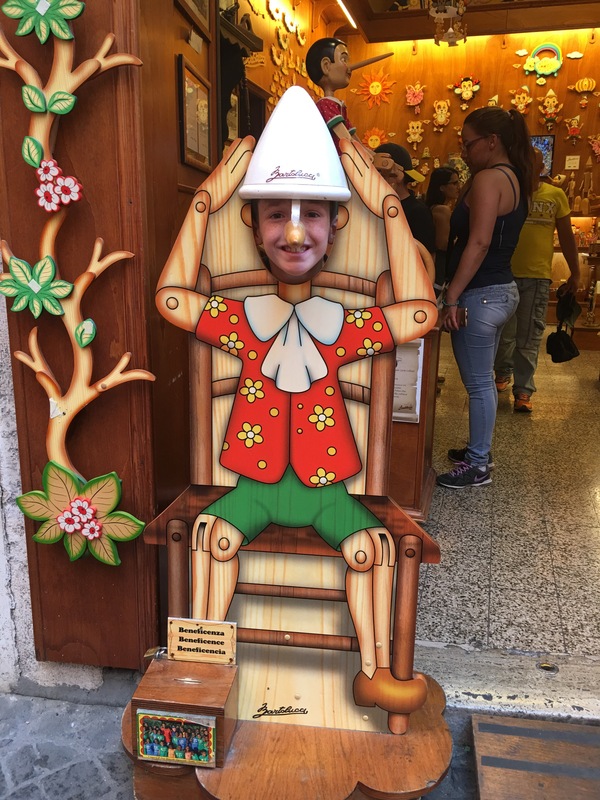 You must eat lots of gelato! As you can probably tell, I don’t really like the traveler/tourist distinction. Depending on where we are, how much time we have there, and how we are feeling that day, we decide what to do. Sometimes it’s throwing a coin in the Trevi Fountain (tourist) and sometimes it’s swimming in the aqueduct runoff with locals (traveler). As you travel you should definitely try to step out of your comfort zone, but that means something different for every person and I don’t pretend to know what that means for you. 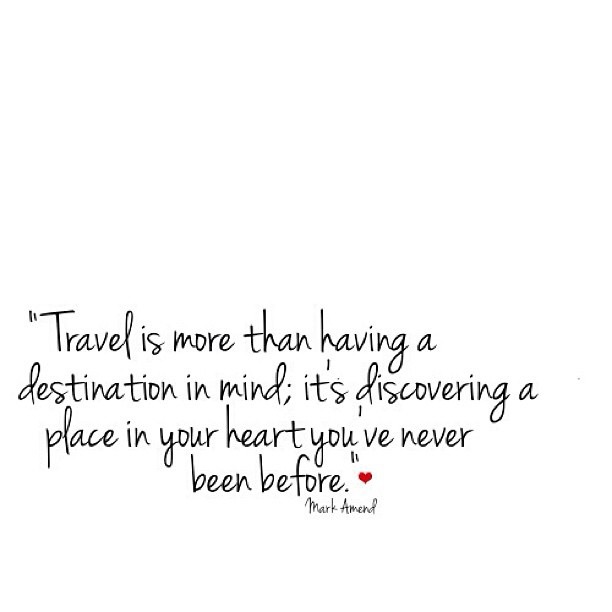 It also doesn’t take traveling across the world to far away places to be a traveler. You can go out and explore in the area where you live right now. Even driving a different way home from work, or going to a new park in your own town with your kids. Jeromy laughs at me because when we get lost or go the wrong way, I’ll often say, “Well at least we got to travel on this new road.” All of it is being a traveler and experiencing new things, which will inevitably make your life richer. Thanks Kevin. I read that post before we left and used much of the advice! The one I didn’t see almost anywhere else was getting a VPN and I agree it is invaluable. Not only is it great for banking and feeling safer on public networks, but it allows us to stream TV and sports from the US when we want a to keep up with the things at home.